symmedia SP/1 is the service portal with which leading machine and plant manufacturers digitize their service processes and offer their customers innovative value-added services. Starting with the connection of machines or systems to the Internet, the machine manufacturer is enabled to make individual service offers to his customers directly at the machine or mobile via app. This allows new business models to be developed and existing service processes to be designed much more efficiently in a common portal. symmedia SP/1 Remote Service is a complete remote maintenance infrastructure that has been specially developed for the high technological and security requirements in mechanical engineering. symmedia SP/1 Parts is the virtual spare parts shop at the customer's machine. The intelligent Parts Agent automatically suggests required wear parts and services. symmedia SP/1 Monitoring enables the continuous collection and visualization of machine data in order to monitor machine states locally and worldwide. The Customer Cockpit is not only the central access to all services of the manufacturer, but also offers the operator support in the daily maintenance of his machinery. For example, he or she can monitor the maintenance due of his or her machines, view current status messages or call up reports on the performance of his or her machines. The Service Cockpit is the central user interface for the manufacturer's service technicians. It includes Remote Service, Maintenance, Parts and Monitoring as required. The KPI Cockpit provides the service manager with all important online service key figures. Connections over the Internet must be one thing above all: secure. This applies in particular to manufacturers and operators of highly complex production systems who want to know their sensitive data securely at all times. 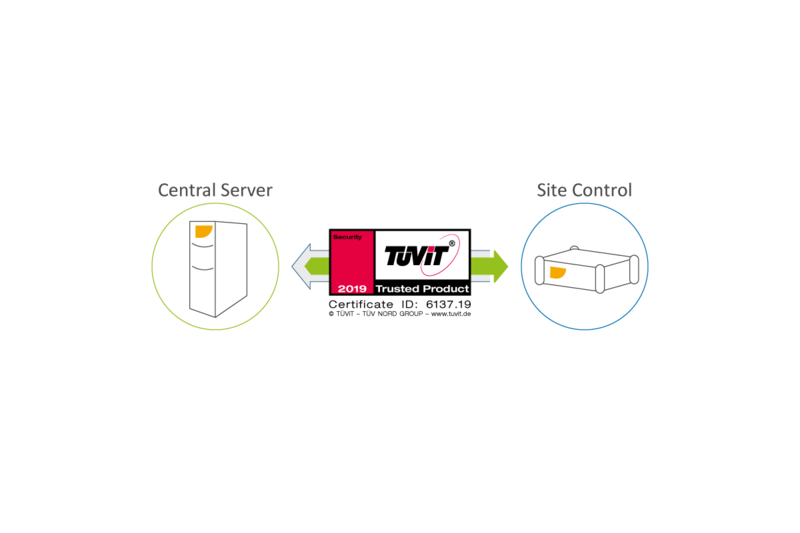 symmedia SP/1 has been certified with the Trusted Product Certificate "TÜViT" and is widely accepted by machine operators worldwide. symmedia instantVPN® is the safety standard symmedia has been further developing for many years and has been specially adapted to the needs of machine and plant construction. A technician can only connect if he has previously received an invitation from the operator. Once the service case is completed, the connection is disconnected again. The operator thus has complete sovereignty - an important argument for being able to sell the service portal as a machine manufacturer on a broad basis. 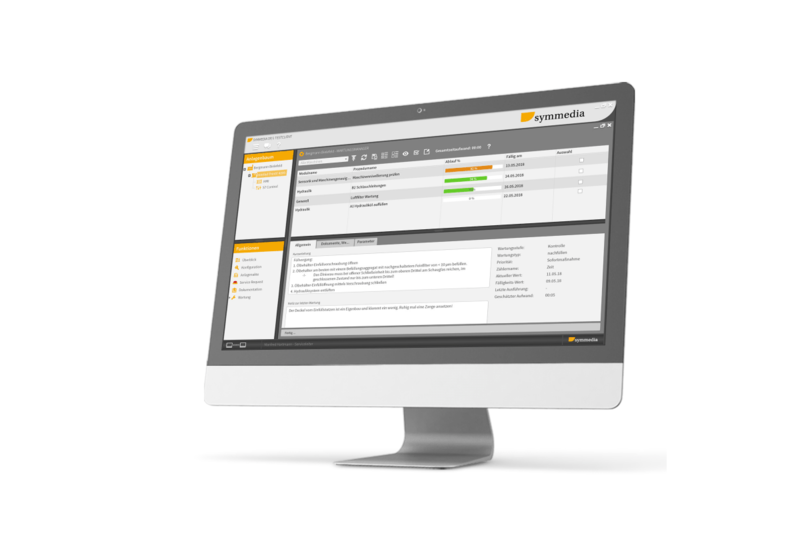 symmedia SP/1 offers comprehensive administration functions: All customer and machine data, service information, documents and contracts are stored clearly and can be called up at any time. All customers and connected systems are managed in the customer database. Above all, it is important to be able to store service level agreements. Service Requests from customers are then automatically prioritized. Other functions include a service archive, logging of all service activities and convenient administration of all users via definable group and role concepts. Mobile devices can be seamlessly integrated into the symmedia SP/1 application. Firstly, the symmedia SP/1 client can also run on tablets, for example. This allows an even more flexible use of the service portal within the plant network. For example, the machine operator can walk around the machine and take pictures, which he transmits to the service technician via the conference center. In addition, a service technician can receive messages on his smartphone when new Service Requests are pending. On the operator side, such mobile messages can be sent if a machine requires parts, maintenance or other services. The symmedia SP/1 Plant app, which is available on all common smartphones, provides management-compatible information on production or the status of the connected machines. This brings service a step closer to the management in the production company. The app combines the most important functions of an MES and a Remote Service Portal and provides all relevant key figures for production - and also for service. symmedia SP/1 Plant thus serves not only the plant manager as a convenient tool for monitoring his machine park and production. It also serves as an additional sales argument when selling the service portal. An even more convenient way of communication is the communication via data glasses. Live images and sound can be transmitted via symmedia SP/1. Hereby the operator has both hands free on site to follow the instructions that he receives remotely by the technician via glasses and headphones. Data can't be safe enough. To ensure a smooth configuration and installation process of the symmedia SP/1 Site Control, symmedia offers various hardware solutions. Both meet the usual high security standards and are equipped with a Linux distribution. 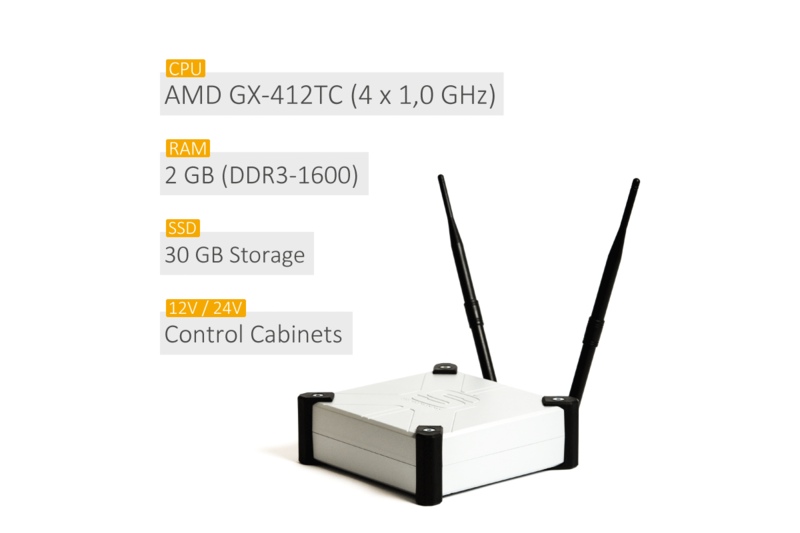 Equipped with 2 GB RAM and a powerful 16 GB SSD secondary memory, the Plug&Work Box Industrial is ideally suited for running even monitoring applications smoothly on the Site Control. Thanks to its new functional design, the DIN rail adapter and the optional 24 V connection, the box can also be conveniently installed in the control cabinet. The symmedia Beckhoff IPC is an Industrial Personal Computer (IPC) , pre-configured and adjusted to the operation of symmedia SP/1. The IPC with its classic design has a 1 GB RAM and 8 GB of secondary storage and can be equally comfortable installed in the control cabinet.